To celebrate Earth Day this year, I want to make something special this year! As my mind was sifting through everything I could make to celebrate, I remember dirt cups! 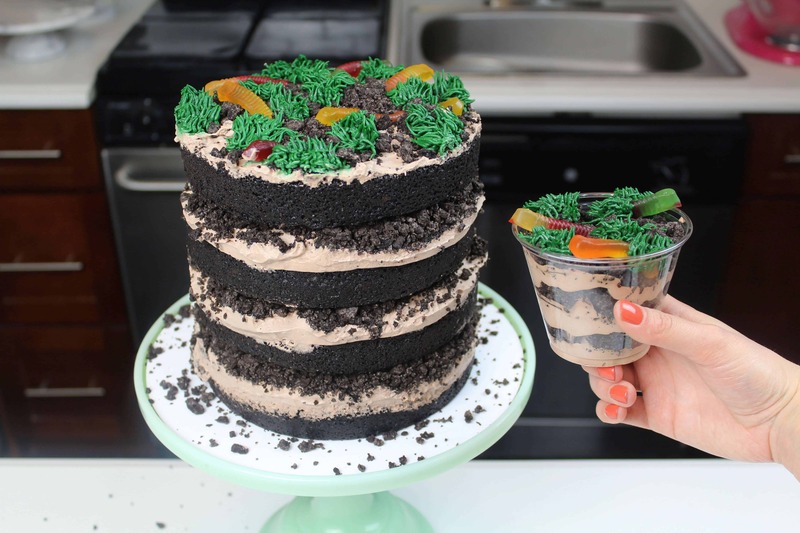 As a child, dirt cups were one of my favorite treats. There’s something so wonderful about the simplicity of them. How can you go wrong with pudding, cool whip, and crushed oreos?! They’re also really easy to make, and I tried to keep this minimalist theme in mind while making this dirt cup-inspired cake. Begin by making the chocolate cake layers. You can use whatever recipe is your favorite, but I highly recommend using a chocolate sponge cake for this, and not adding simple syrup! Usually sponge cake and simple syrup go hand in hand, but since the pudding filling is pretty soft, it keeps the cake nice and moist. This recipe is very flexible, so you can make whatever size of cake layers you prefer, and however many layers you want! I opted to make four, 7-inch cake layers, but this could definitely be made with three 8-inch layers, or even two 9-inch layers! Once the layers are baked, allow them to cool fully. I like to place the layers in the freezer for about 45 minutes to accelerate the cooling process. Once fully cooled, level the tops using a serrated knife. While the layers bake and cool, prepare the pudding filling! Whisk together 1 package of instant chocolate pudding with 2 cups of cold milk. Cover with plastic wrap, and place in the fridge for about 15 minutes, to allow it to set. Once the mixture has firmed up, fold in the entire container of cool whip using a spatula. When the cool whip has been fully incorporated, cover and set aside. Then it’s time to assemble the cake! I chose to stack the layers using acetate sheets (channeling a momofuku-inspired look), but after I remade this cake for one of my Food Network live streams and omitted the acetate sheets, I found it’s actually much easier to assemble this cake without them! The pudding mixture stays rather soft, so it doesn’t really firm up after being chilled. I also had some of my Oreos cascade down around the base as I removed the sheets. 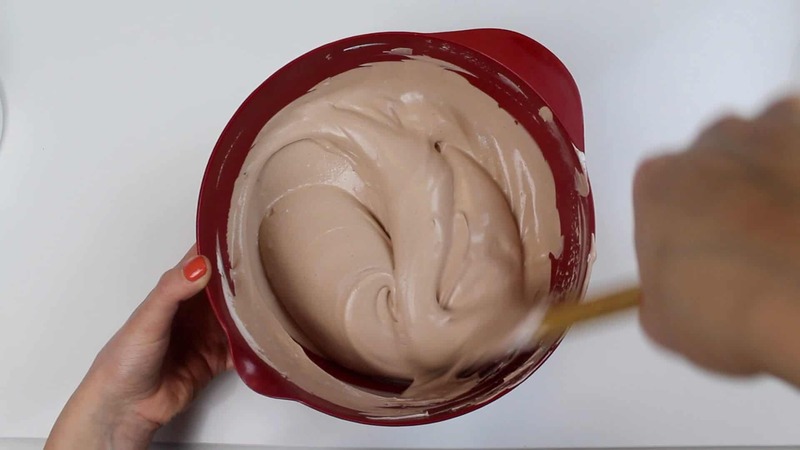 To build the cake, cover the base layer with a generous layer of pudding mixture, spreading it evenly over the layer using an offset spatula. Sprinkle with chopped Oreos. Repeat with remaining cake layers. 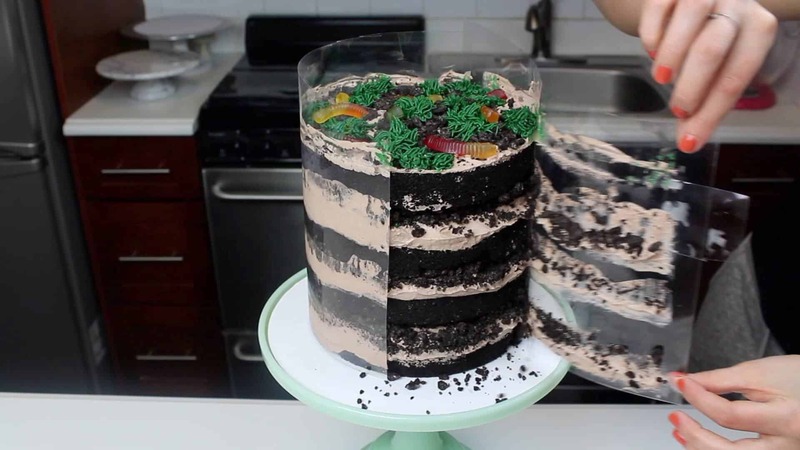 Once all the layers are stacked, top the cake with one final layer of pudding mixture and Oreo bits. If desired, you can also pipe some grass patches on top of the cake with some green buttercream and a small grass tip (like a Wilton #233). The last step is to add the gummy works on top!! This cake feeds around 20 people, and will be gone before you know it! Be sure to cut the cake using a very sharp knife, as it will be very soft with all the pudding between the layers. I brought the leftover cake into my office, and my coworkers couldn’t get enough of it. it would, but would make slightly taller layers! Or you could make 5 layers! What Cocoa powder did you use in you cakes I was thinking of trying the king Aurthur Dutch cocoa ?? What do you recommend ? That would be fine, I used some black coca that I got on amazon! It was the Wincrest brand, which I really like baking with.